Why pundits who see echoes of the housing bust in student loans have it wrong. I understand why some people feel compelled to compare the student loan crisis to the housing bubble. Really, I do. They both involve a big, sudden run up in borrowing by dubiously credit-worthy customers followed by a giant wave of defaults and delinquencies. And given how scared everyone is thanks to the last great bust, it's forgivable that they'd start seeing its ghost elsewhere. We've all got a bit of financial PTSD. But the student loan crisis is not the housing crisis. It's a different beast altogether. And conflating the two leads to some really poor, misleading analysis. Take this article from CNBC's John Carney, titled "The student loan bubble is starting to burst." Yesterday, the news broke that JPMorgan Chase, the largest bank in the United States, had officially decided to give up on the college loan business. This was long in the making. 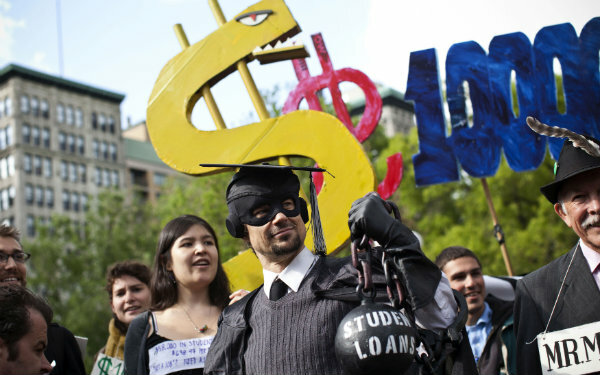 Last year, the bank stopped making student loans to new customers. Now it's shuttering the whole operation. "We just don't see this as a market that we can significantly grow," Thasunda Duckett, chief executive for auto and student loans at Chase, told Reuters. "It's no longer sustainable and not the right place to allocate capital in the future,"HSBC Holdings Group Chief Executive Michael Geoghegan said in a statement the day HSBC shut down its subprime unit in 2007. In Carney's defense, vague financial industry PR speak in 2013 does indeed sound a lot like vague financial PR speak in 2007 . But this is probably one of the only times in history where a reporter would have been better off taking a bank at its word. There are plenty of rational reasons why a Wall Street behemoth like JPMorgan might have given up on the student loan game, none of which have anything to do with an impending market collapse. To start, the business used to be much more lucrative. Under the old federal lending program, private banks issued loans to college kids, and the debts were guaranteed by Washington. It was all profit, and virtually no risk for investors. But in 2010, Congress and the Obama administration pulled the break on the gravy train and today, all federal loans are made directly to borrowers by the Department of Education. As a result, lenders like Sallie Mae, Wells Fargo, and JPMorgan have been left to scrap with each other over the far tinier market for private student debt. The Consumer Financial Protection Bureau estimates that financial institutions issued less than $6 billion worth of college loans in 2011. The federal government, in contrast, lends more than $100 billion a year to students. In other words, private student lending has been reduced to a niche. But for JPMorgan, it barely even qualifies as that. There are more than $150 billion worth of outstanding private student loans; according to Reuters, JPMorgan owned just $5 billion of them. The bank has 10 times more auto loans on its books, and 24 times more credit card debt, to say nothing of mortgages. Bruno Iksil, the notorious London Whale, lost more money for JPMorgan on a single ill-fated trade than the bank currently has at stake on its entire private student loan portfolio. Not that its student debt exposure was much of a gamble. According to JPMorgan's most recent quarterly report, the delinquency rate on its education loans was a mere 2.23 percent, about half the late payment rate on its mortgages. It's recently had to write more of its credit card balances off as a loss than it has student loans. Altogether, there's simply no sign that defaults could have been grave enough to drive the bank out of college lending. The simpler explanation is that JPMorgan gave up on its student loan business because it wasn't much of a business. That said, I think there are things we can learn about the student loan market from JPMorgan's exit. Part of the reason private education lending is so diminished today is that banks have had to clean up their act. Before the financial crisis, banks were happy to pump out loans to undergrads en masse with little regard for credit standards, subprime style. The CFPB estimates that in 2008, they issued $20 billion worth. Since the crash, they've drastically tightened up their lending standards, and the flow of loans has slowed to a drip. If there ever was a bubble in private student lending, it's already burst. But there's also a greater point here. For the most part, it's not helpful to think of student lending, circa 2013, in terms of bubbles at all. Rather, as Chadwick Matlin has put it at Reuters, it's more of an anvil weighing on a large but discrete group of very unfortunate borrowers. In all but the most rare circumstances, it's impossible for former students to discharge their bad debts in bankruptcy. That means the government is mostly protected from defaults. So are the banks, to a degree. Young adults, however, are on the hook for debts they can't handle, but which they'll likely continue to take on so long as college costs stay high. There won't be a moment where the market goes "pop." But there's still a crisis that needs to be addressed.